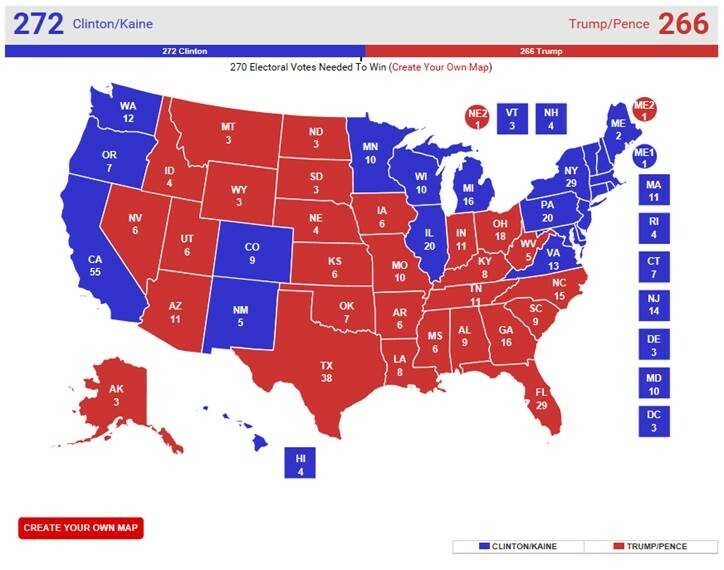 Americans prefered Trump to Clinton. The polls were totally wrong. Although Trump was elected president because of the peculiarities of the US electoral system, Clinton had more votes than Trump. In fact what Trump called “the electoral college disaster” in 2012 was making him president, despite having had less votes. Was the election outcome a surprise? Only to certain extend. This chart was the best estimation the day before the election. Trump won PA (+20), WI (+10), MI (+16) and lost NV(-6), and he went from 266 to 306 electors. In PA, WI and MI the difference was only +1% and that made the difference. The polls, were not that bad, but the media and investors were the ones who did not properly read that beforehand was already a very closed call.